Contractor Grade Water Treatment - 25% more concentrated. Spot-treat the trouble areas of your waterfall, stream, and rocks on contact. 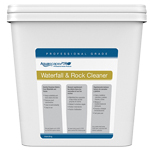 Professional formula quickly dissolves debris from waterfalls and rocks. Quickly dissolves debris from waterfalls and rocks. Goes to work instantly treats up to 3,650 sq. feet.